I love Pinterest. It’s one of my favorite business-building tools and it was essential throughout the big home remodel we’re just finishing up. I also love a good planner. They’re fun to look at and plan with, they can help motivate you to move closer to your goals. And the stickers! SO much fun! 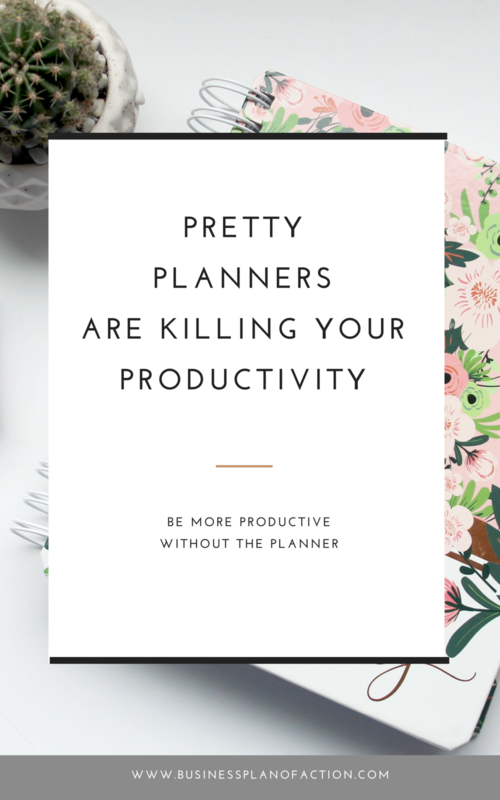 But let’s face it: Pretty planners are a huge waste of time. Yes, I said it. You can spend so much time making them look pretty--color coding, “intentional” doodles, those stickers--that they’re not doing anything for your efficiency. They’re not helping. I honestly want to pull my hair out when I see business owners brag about updating their planners each month. We live in a digital age, thank goodness. (I think it’s safe to say that few, if any, of us could do the work we do without online tools.) It’s time to start using those digital tools to help with productivity. And we can do a little for the environment at the same time, if we ditch those pretty planners. When I moved from a 4500 square foot home to a 1000 square foot home with four kids, two large dogs, a husband, a home-based business and a desire to continue homeschooling, I was forced into the digital world. I started by using Basecamp for homeschooling. It was a handy place to keep my children’s lessons and work--and it’s free for educators. Eventually I moved to Trello, and started using that to manage some of the day-to-day household tasks, plus my kids now use it to organize their schoolwork and chores. Of course, if you’ve been following me for any time at all, you know my obsession with using Trello in my business. I’ve created courses for it, have free templates available and I talk about it all the time. I’m truly hooked! And the best part? I no longer have scraps of paper listing out all my to-do’s for each day. I’d like to challenge you to go paperless as much as possible. The less paper you have floating around, the less chance you have to forget something, the cleaner your house will be and the more grounded you feel. I promise. And that means...stop hanging onto your children’s artwork and inventing new places to display it. I understand that you want to encourage creativity, but that doesn’t mean you need to keep it forever. My solution has been to take a photo of all my kids’ artwork and store it on a Trello board. You can also use resources like Chatbooks to create a beautiful book full of each child’s art. You can store literally everything online. Scan your vital documents and create folders for insurance, home, retirement, cars, each child and more. Then Marie Kondo all the clutter and have it shredded. You can do the same for your business. Store your receipts in a digital app, record your mileage automatically with--you guessed it--an app and store your client questionnaires in a digital file. And those planners? Get rid of ‘em! A pretty planner isn’t going to remind you about that meeting in an hour, but a digital calendar sure will! A pretty planner won’t alert you that it’s time to drink more water or get out of your chair to move, but there are loads of digital tools that will. It’s time to streamline your life and your business so those goals you set a month ago really do come to fruition--through countless hours of saved time! And for the record, I use Pinterest for inspiration every day. But I make it a point to go into my Pinterest time with intention, then set a timer to cut myself off. It’s all about discipline! Want to start using Trello for your business? You’re in luck! I have a video for that. One way to get started going paperless is to develop workflows that simplify and streamline. You can do this with my workflow wizard workbook below!